Cho is a young composer with a clear idea of where she wants her music to head, and in just a few years since graduating has honed her voice into a fascinating and original addition to the Malaysian new music tapestry. In 2008 during the HSBC Young Composers Workshop 08 a delightful piece for flute and piano Rivulet, was selected for a read through during the final night open workshop at KLPac. Staying under the radar, not much had since been heard from Kuala Lumpur-based young composer and pianist Jessica Cho, until she returned recently from her studies in the UK, like a butterfly emerging from a cocoon. Jesssica has since written a number of works for small groups, a work for symphonic band and most recently music for the Malaysian Philharmonic Orchestra’s project to accompany the local epic film Merong Mahawangsa. Having been inspired to compose after an encounter with the music of Adeline Wong, whom she then sought as her first composition teacher, Cho furthered her studies at the University of Sheffield where she obtained her Masters of Music. 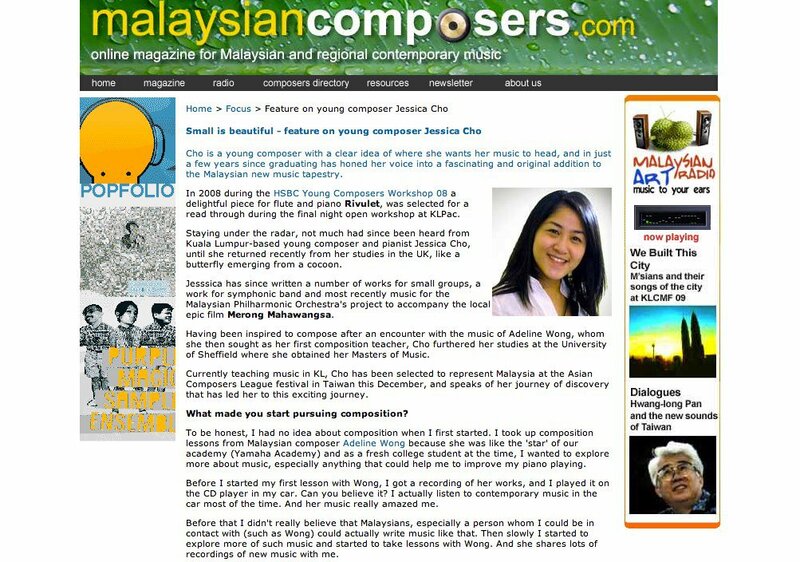 Currently teaching music in KL, Cho has been selected to represent Malaysia at the Asian Composers League festival in Taiwan this December, and speaks of her journey of discovery that has led her to this exciting journey. What made you start pursuing composition? To be honest, I had no idea about composition when I first started. I took up composition lessons from Malaysian composer Adeline Wong because she was like the ‘star’ of our academy (Yamaha Academy) and as a fresh college student at the time, I wanted to explore more about music, especially anything that could help me to improve my piano playing. Before I started my first lesson with Wong, I got a recording of her works, and I played it on the CD player in my car. Can you believe it? I actually listen to contemporary music in the car most of the time. And her music really amazed me. Before that I didn’t really believe that Malaysians, especially a person whom I could be in contact with (such as Wong) could actually write music like that. Then slowly I started to explore more of such music and started to take lessons with Wong. And she shares lots of recordings of new music with me. What was it about Wong’s music that attracted you, and which works of hers in particular? I was attracted by her melodies, rhythms and the colours that she used in her orchestral works. Even in her chamber work Synclastic Illuminations, the energy and texture she used makes it sound as if a full orchestra is playing. I like her Paces (for piano and electronics) and Snapshots (for cello solo and chamber orchestra) a lot. I like the way she used some really common elements in life and put them into music, and make them work so well in Paces. And also the dramatic tension in Snapshots, which always frightens me in certain parts. What are the things you have learnt from Wong and in UK that are most important to your compositional approach now? Structures and colours. I like to explore different sounds that one instrument can produce and experiment. So when I started writing chamber works, I started to look into the colours that I could get with different combinations of instruments. And structure, although contemporary music sounds weird a lot of the time, they are all still well structured. It’s like the back bone of a piece of music, really. During my final year in Sheffield, I learned a lot about detailed notations in music; even a single slur can affect the whole piece of music. How would you describe your compositional style or aesthetic, when you first started out (for example in Rivulet for flute and piano of 2008) and how has it developed over time? Rivulet actually is my second work which is revised from a flute solo piece that I first started while studying with Wong. It’s more atmospheric, I could say. Probably Debussy and Ravel’s music were more familiar to me at that time. But slowly, during my Masters studies in Sheffield, I began to feel that I had started to gain my own voice in my music. I started to write my first piece (Sketches for Viola) without using a keyboard or any instrument to help me. The notes are entirely from my head instead of my fingers (which in the past I would usually play on the piano to experiment). From then on, I practised a lot writing without the aid of instruments, just like what Schoenberg had done. And surprisingly the short little piece for viola which was recorded and posted on Facebook was spotted by conductor Kevin Field, and he invited me to send in scores for auditions to the MPO Forumplus. During my final year in the UK, I performed a piano recital entirely based on contemporary repertoire and I explored a lot on smaller pieces like Kurtag’s Jatekok, Carl Vine’s 5 Bagatelles and Schoenberg’s Six Little Pieces for piano. These are not really little, but actually condensed versions of a larger piece in concept, the details of the writing are amazing and even a single note means so much in the music. And that is what I’m looking for and trying to get in my music. That’s why I’m now writing more smaller pieces particularly for piano and am planning to compile them into a volume of small pieces for pianos. Why determined your choice for your ACL competition submission, the 5 Little Pieces for piano? The 5 Little Pieces is very much inspired by Kurtag and Schoenberg; they are small but not meant to be played by children. The reason that I chose it is because it’s a good representation of myself. I have small hands and mostly explore sets of smaller pieces like song cycles. And the advantage of these smaller pieces is that I can have so many different characters in a piece of work. It sounds a little bit greedy, but yeah. And for this set, I actually started with the third piece, which is the central piece of the entire set. Because when I started to write this piece, I was thinking of exploring more on rhythms and melodies in my music. Then I started to play around on the piano like drumming, and then I got the idea for this piece. And the last piece in the set is really to explore the harmony of the piano. I feel very satisfied with these pieces because I have achieved what I wanted in my music; the naughtiness, the craziness, the calmness, the details and the rhythm. How do you feel representing Malaysia in Taiwan after our nation’s absence in the competition for over a decade? I feel excited but nervous; it’s one of the largest festivals that I’ve ever participated in. Unlike the MPO Forum, this involves composers from other Asian countries. I used to deal with European composers and so I am used to the culture in the UK. I hope ACL will not be too harsh on me! What do you think your role as a composer is in the context of Malaysian society? To be honest I’m not an active composer. I write when I feel like it. But since I started to compose, I always think of what the composer might have thought of when they composed. Which is really helpful and has significantly changed my music appreciation and musicality. And as a lecturer, teaching harmony (like what Schoenberg once did), I am trying to make harmony lessons more interesting so that the students can understand the usage of harmony in the musical context. And for my piano students, I always encourage them to think more, visualise and imagine when they attend to a new piece. My future plan is to get some of my piano work published. They are not only for advanced players, but for beginners and amateur pianists as well. And in this case, I wouldn’t have the problem of losing my manuscript like how Bach did. Who knows, something which is not popular and well received now could be something big in the future? And after the MPO Forum, I have been thinking of getting some Malaysian women composers’ works compiled into a CD and probably would like doing some biographical research on them. These are not only limited to contemporary classical composers, but it could also be Indian music composers for example. 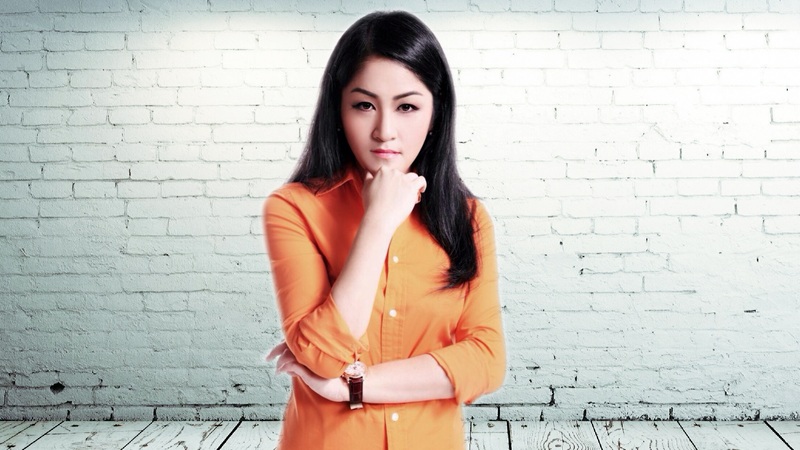 We have lots of talented female composers in Malaysia, but they are not well known.